Welcome back to The Boot Room for the FIFA 14 season where every week, Matt Cuttle and and our good friend Darren Cross, from MATCH Magazine, talk through tips and tactics relating to every aspect of FIFA 14. On this week’s episode, Matt and Darren discuss the impact of the new sprinting system in FIFA 14 which has been completely altered. Also, catch up with their first FIFA 14 video where they looked at what is new in FIFA 14. 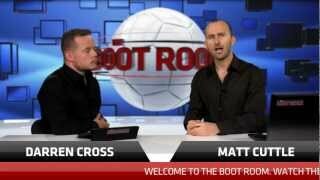 Join Matt and Darren next time when they will discuss the best ways to build an attack in FIFA 14.